Welcome to the official site of Renz - 'Poet of the Impossible', one of the finest magicians and creative minds in Scotland. If you're looking for a truly memorable performer that can entertain and astonish, look no further. Renz has had a busy summer: he toured his show- 'Poet of the Impossible' - a unique blend of magic and spoken word, wrote and performed a special set inspired by Robert Burns at the International Magic Festival and travelled from the Channel Islands to the Highlands and every where in between performing close-up magic at special events including 02's launch of the iPhone8. An editorial on Renz's involvement in the International Magic Festival. Renz created and performed a short piece inspired by Robert Burns. 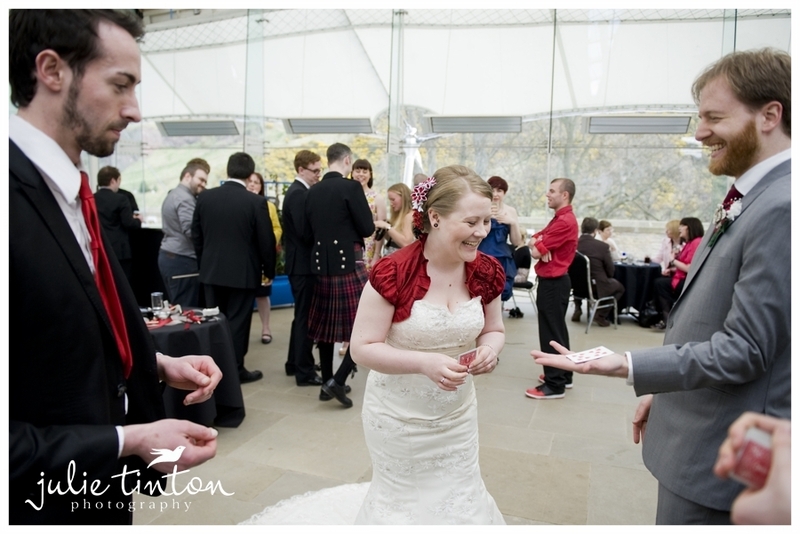 Entertaining bride and groom at a wedding drink reception at Our Dynamic Earth in Edinburgh. Renz has performed at several hundred weddings all over the UK. A promotional image for Renz's show - 'Mystic'. Onstage at the Edinburgh Fringe Festival. Renz has taken three different shows to EdFringe: 'Mystic', 'Spellbinder' and 'Poet of the Impossible'. Amazing fellow scots-italian, Paolo Nutini, at a launch party for the RockNess Music Festival. Renz was raised in South Lanarkshire by his italian father and scottish mother. As a child Renz's father would occasionally tell him folk tales originating from the small italian village he came from whilst his devoutly religious mother told him stories of saints and miracles. Although it would be many years before Renz started to perform magic, these early influences instilled a lifelong fascination with the impossible. At the age of 9, Renz began learning Karate with his father. The self discipline ingrained in him through this would later come into practice when he started to learn complex magic effects which would take years of careful thought and repetition to master. Aged 18, and still with no signs of a career in performing, Renz went to Edinburgh to study Sport Science at University. During the course Renz started to become aware of magicians like David Blaine and Derren Brown who were truly bringing something unique and special to the art of magic. Deeply inspired, Renz started to learn magic effects from books and try them on his fellow students at lectures and tutorials soon gaining a reputation as the course magician after 'stealing' a lecturer's watch from his wrist. After graduating, Renz returned to Glasgow and continued his journey by performing on the streets of Glasgow sometimes recording his adventures and putting them on YouTube. However, his big break came through live performance. In winter 2011, he heard of an audition to perform at The Citizens Theatre. The successful auditionee was to compere the intervals during a run of shows in the prestigious Citizens Theatre in Glasgow. Renz impressed and the panel turned down established professionals to go with the, then, unknown "Renz" ("Stunned our audience. This man is a genius" - Citizens Theatre Twitter Feed, 2011). A flood of private bookings followed this appearance and shortly afterwards Renz also began developing and performing his first show, Burn Witch Burn - a show written and performed for Halloween in a historic (and reputedly haunted) hotel in Glasgow's cathedral precinct. The show stoked quite a bit of intrigue - STV Glasgow did a LIVE feed from one of the shows and on one evening guests got quite a fright when a complete blackout came over the city centre during the climax of the show! Evening Times editorial on 'Burn Witch Burn'. The fringe festival show was eventually named "Mystic". It focused on illusions of mind reading and premonitions of the future, a departure from his close up work but Renz performed street magic on the The Royal Mile to entice people to the show. The strategy worked and he played to full or near full houses for a week. Subsequently Renz developed the show 'Spellbinder' featuring - for the first time - his self levitation illusion. The show received glowing reviews from Fringe Review and Broadway Baby. Most recently Renz created the performance, 'Poet of the Impossible'- a delicate weaving of spoken word poetry and magic effects. Not only did it receive excellent reviews as a magic performance but it also featured in The Culture Trip's top 10 spoken word performances at EdFringe 2016. The show also caught the attention of senior members of the Scottish Conjurers Association and Magic Circle who invited Renz to join these organizations on the basis of his performance. This year, after taking 'Poet of the Impossible' to events such as Carlisle Fringe and Brighton Fringe, Renz returned to Edinburgh to perform at the International Magic Festival. Who knows what the future holds. After finding this website, Renz was directly invited by the producers of Britain's Got Talent to audition for the LIVE broadcast. Renz could appear on your TV in the near future but he's adamant that in a day when anything can be edited or doctored by computer graphics and technical wizardry the only way to experience magic is LIVE, in person. Currently Renz is developing a new show for next year as well working on new close-up magic. As an established playwright (See 'Cracked Tiles' below) he is also redrafting his second theatrical play - 'Sticks & Stones'. When not writing and performing Renz likes to play football, do martial arts and travel. In 2016 Renz performed two shows concurrently at EdFringe- 'Poet of the Impossible' and his debut theatre play - 'Cracked Tiles'. You can find out more about this strand of work by clicking the ‘Dramatist’ link on the bar below.